The following is the section on Coal-bed Methane excerpted from Oil and Gas at Your Door? -- A Landowner's Guide to Oil and Gas Development, reprinted with permission from a report published by the Oil & Gas Accountability Project. Methane is loosely bound to coal -- held in place by the water in the coal deposits. The water contributes pressure that keeps methane gas attached to the coal. 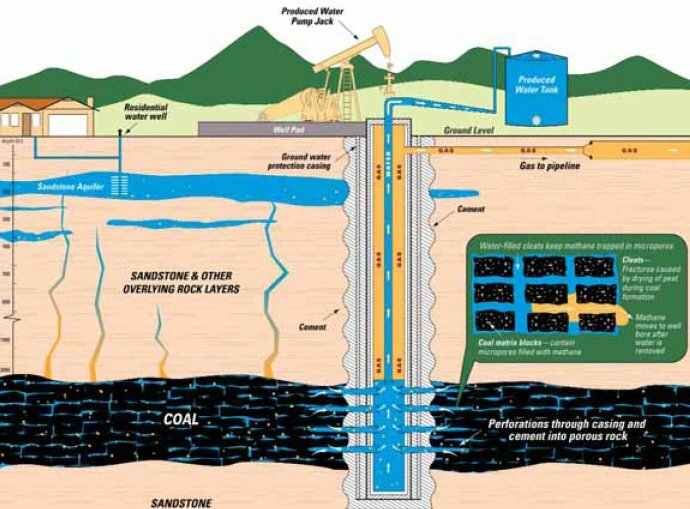 In CBM development, water is removed from the coal bed (by pumping), which decreases the pressure on the gas and allows it to detach from the coal and flow up the well. 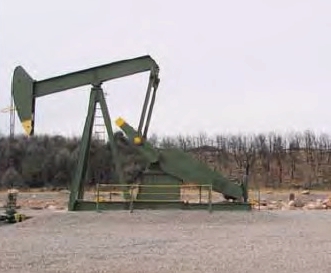 In the initial production stage of coalbed methane, the wells produce mostly water. Eventually, as the coal beds near the pumping well are dewatered, the volume of pumped water decreases and the production of gas increases.161 Depending on the geological conditions, it may take several years to achieve full-scale gas production. Generally, the deeper the coal bed the less water present, and the sooner the well will begin to produce gas. 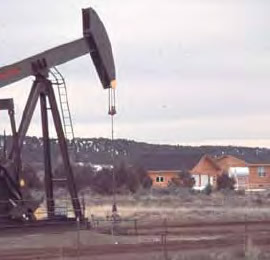 As with conventional gas wells, hydraulic fracturing is used as a primary means of stimulating gas flow in CBM wells.164 Another gas stimulation technique, unique to CBM wells, is known as cavitation (also known as open-hole cavity completion). The coal fragments and gas that escape from the well are directed at an earthen berm, which is supposed to prevent the materials from entering the greater environment. The gas is burned or flared, and the coal fines and fluids initially collect in a pit at the base of the berm. Some loose rock and coal materials remains in the well. They are cleaned out by circulating water (and often a soap solution or surfactant) within the well and pumping the material into a pit. 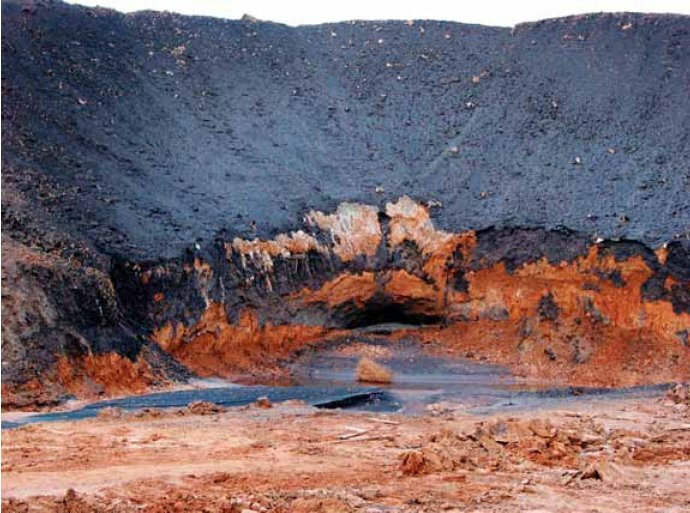 The coal refuse is then typically burned on-site in a pit, which is either referred to as a "burn pit" or "blooie pit." The cavitation process is repeated several dozen times over a 2-week period.167 This results in an enlargement of the initially drilled hole (well bore) by as much as 16 feet in diameter in the coal zone, as well as fractures that extend from the well bore.168 If the cavitation fractures connect to natural fractures in the coal, they provide channels for gas to more easily flow to the well. Depending on which state you live in, produced water may be: discharged onto land, spread onto roads, discharged into evaporation/percolation pits, reinjected into aquifers, discharged into existing water courses (with the proper permit), or disposed of in commercial facilities. In some states, standards for produced water disposal are becoming more rigorous, and certain disposal practices are losing favor. Surface discharge, for example, is a controversial method of disposal, as it can lead to a build-up of salts and other substances in the soil, and affect the productivity of the land. In some states, re-injection is the only option for disposal.171 See section on Impacts Associated with Oil and Gas Operations for more information on produced water disposal options. In some areas, coal beds may be important local or regional aquifers (natural underground water storage zones), and important sources for drinking water.172 It is important, therefore, that landowners find out how companies are planning on disposing of produced water, and what impact its removal and disposal might have on water supplies. A worker attempts to remove coal dust from trees. From exploration through site abandonment, noise is generated by truck traffic, heavy equipment, seismic explosions, drilling rigs, motors that power pumps, and gas compressors. The noise from all of the equipment may be a frustration for landowners. The constant noise from pumps and compressors, however, can greatly affect a landowner's quality of life, and have negative impacts on livestock and wildlife. In 2001, a fire outside of Durango, Colorado, was ignited during the cavitation of a coalbed methane well. When the well was surged the escaping gas ignited a grass fire, which quickly spread to surrounding trees. Fortunately, the fire did not reach any of the nearby residences. 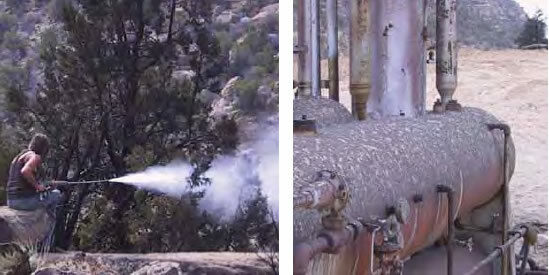 The total cost of the fire suppression was estimated by the Bureau of Land Management to be $500,000. The coal brought to the surface (100 tons on average) during cavitation is burned on site, which can last anywhere from 7 to 10 days. The pollution from burning this waste coal can be a concern for nearby residents, especially because oil and gas well "completion techniques" like cavitation are largely unregulated (e.g., they are exempt from certain environmental laws like the Clean Air Act). Pollution normally associated with coal burning includes: nitrogen oxides, carbon dioxide greenhouse gases, sulfur dioxide, lead and mercury. The noise associated with cavitation is a major concern for landowners, livestock and wildlife. As mentioned above, jet-like noises can last for up to 15 minutes. If no notice is provided to landowners, the abrupt and shocking sound can startle livestock and residents. of the size mentioned above. It is possible that coal debris could find its way into local drinking water wells. The underground explosions are not contained, and consequently, could come in contact with groundwater flows. Coalbed Methane Transactions News (sources: Dow Jones Interactive, dialog and Northern Lights). In Coal Bed Methane Alert, No. 13, August, 2002. Types of coal include: sub-bituminous (soft, lowest energy content), bituminous, and anthracite coal (hard, highest energy content). La Plata County Energy Council. See endnote 165. McCallister, Ted. See endnote 168. U.S. EPA. pp. ES 1-5 and 3-10. See endnote 173. Cited in a letter from the Natural Resources Defense Council to the Chief of the EPA, October 28, 2002. WORC. p.3. See endnote 155. U.S. EPA. August 2002. See endnote 173. U.S. EPA. See endnote 173. Merschat, Walter. See endnote 179. Correspondence between Carl Weston and the Oil and Gas Accountability Project.